Capital City Electrical are fully qualified electricians based in Edinburgh. They have been NIC EIC approved electrical contractors since 2009 and offer a full range of electrical services. Our service to landlords is comprehensive, we can undertake and supply full Testing and Inspection Reports, EICRs, PAT Testing and HMO works. If you require to ensure you are legally compliant and your property is absolutely safe, we can help. We can advise on requirements and regulations for new buildsboth first fix and second fix, and carry out the work to the highest standard, supplying all necessary fixtures and fittings. If you find that your property is reaching the point where the wiring and fittings require up-grading, we are the experts! We have extensive experience in this field and can develop your new system with minimum disruption, cost effectively and sympathetically to the style of your home. Whether you require a new up to date, eco-friendly, efficient replacement heating systems or an up-grade to your existing system, we can help, ensuring that all of the plumbing and other trades required to do the job are organised efficiently and timeously. We are also very experienced in fault finding, changing fittings and fixtures, installing electrical showers and ensuing that your fuseboard can cope with all of this – when and if it is necessary! 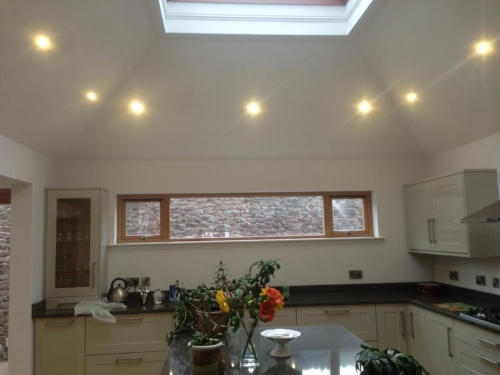 We can also install state of the art lighting in your home to give economical, attractive ambient light which is easy to control. Turned up on time at very short notice and carried out a tidy job, have and will be using again to carry out work on behalf of my company in the future.